At a press conference in Delhi on August 24, 1949, M S Golwalkar, the organisation’s second sarsanghchalak, termed Pakistan an “uncertain state”. Suruchi Prakashan, a publishing house run by the RSS, has brought out a map called ‘Punyabhoomi Bharat’ in which Afghanistan is called “Upganathan”, Kabul “Kubha Nagar”, Peshawar “Purushpur”, Multan “Moolsthan”, Tibet “Trivishtap,” Sri Lanka “Singhaldweep” and Myanmar “Brahmadesh”, among others. A caption, in Sanskrit, below the map reads, “All that’s south of the Himalayas and north of the Indian Ocean is Bharat”. There are several other RSS publications, including a book titled, Pratyek Rashtrabhakta Ka Sapna: Akhand Bharat (Dream of every patriot: Akhand Bharat), that champions the cause of Akhand Bharat. When Prime Minister Narendra Modi made a surprise stopover at Lahore to greet Pakistan PM Nawaz Sharif on his birthday, December 25, 2015, the move was heralded as nothing short of a master stroke, reminiscent of former PM Atal Bihari Vajpayee’s cross-border diplomacy of the 1990s. But a day later, on December 26, BJP national secretary and RSS pracharak Ram Madhav, in an interview broadcast on Al-Jazeera television channel, spoke of “Akhand Bharat”, one that would see Pakistan and Bangladesh reunited with India “through popular goodwill”. “As an RSS member”, Madhav had said, “I hold on to that view”. The statement caused much controversy, and stole the thunder from Modi’s surprise Lahore visit, with many questioning the BJP’s and the government’s real political intentions, given that the RSS governs the ideology of the party. It’s a view the RSS, which was formed in 1925, started propagating in 1947, after Partition. 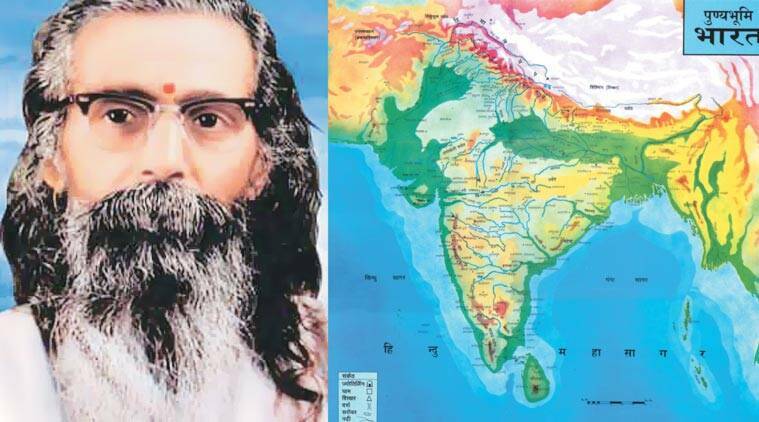 At a press conference in Delhi on August 24, 1949, after the government lifted the ban on the RSS — imposed on it for its role in Gandhi’s assassination — M S Golwalkar, the organisation’s second sarsanghchalak, termed Pakistan an “uncertain state”. “As far as possible, we must continue our efforts to unite these two divided states…Nobody is happy with Partition,” he had said. He had repeated this view at another press conference held in Kolkata on September 7, 1949. RSS’s idea of “Akhand Bharat” includes not only Pakistan and Bangladesh, but also Afghanistan, Myanmar, Sri Lanka and Tibet. It terms the combined region as a “Rashtra” based on “Hindu cultural” similarities. Suruchi Prakashan, a publishing house run by the RSS, has brought out a map called ‘Punyabhoomi Bharat’ in which Afghanistan is called “Upganathan”, Kabul “Kubha Nagar”, Peshawar “Purushpur”, Multan “Moolsthan”, Tibet “Trivishtap,” Sri Lanka “Singhaldweep” and Myanmar “Brahmadesh”, among others. Sapre writes of making the idea of Akhand Bharat “possible through our manliness (purusharth)”. “People who want Akhand Bharat must continue their efforts with indefatigable self-confidence. This is need of the hour,” says a line in the book . RSS literature — books and songs — is replete with references to “Akhand Bharat”, and continues to be sold at book shops run by the organisation. The first edition of Sapre’s book was published in 1997. Its fourth edition was published in January 2015 by Archna Prakashan, Bhopal. But all publications insist Akhand Bharat is a “cultural” entity, not a national or political one.